Brown anole lizard, photographed at Greynolds Park East, North Miami, Miami-Dade County, in March 2015. Brown anoles, Anolis sagrei, are everywhere. In the deepest of woods, in your yard; most likely a few even have gotten into your house. 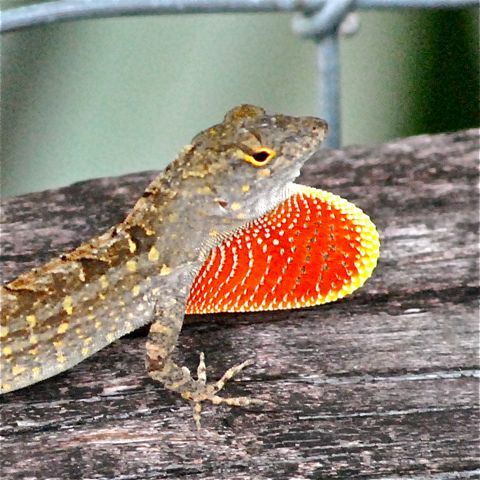 The brown anole might be Florida's most successful import since the snow bird. The lizards are natives of Cuba and the Bahamas who made their way to the U.S. as pets and accidental tourists, in some cases, escaped captivity and reproduced like crazy. 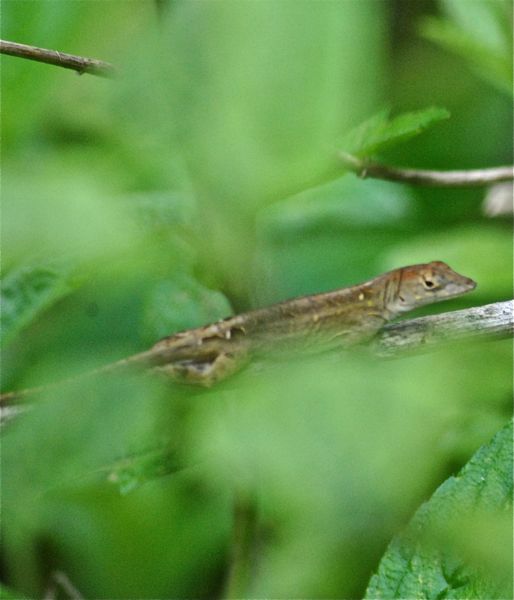 In places, it's been estimated that as many as 2,000 brown anoles occupy a single acre. That's a lot of lizards. 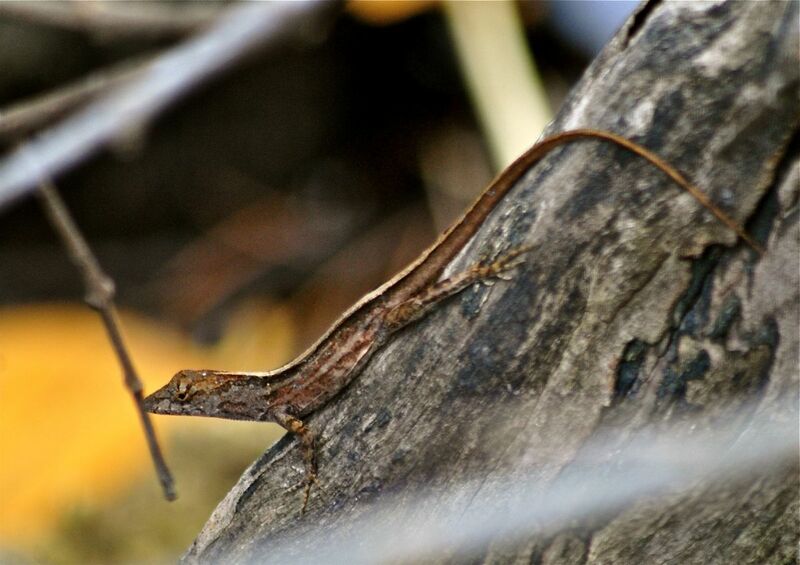 Brown anoles were first observed in the Florida Keys in 1887, most likely arriving as stowaways on ships. The population began to explode in the 1940s, entering Florida via the state's major ports. We're figuring the war and its aftermath probably had something to do with it. From the ports, brown anoles made their throughout the state essentially by hitchhiking — by car and by truck and by boat. They're now found in 52 of Florida's 67 counties — and their range continues to expand. They were discovered in Miami-Dade County in 1951; in Palm Beach County in 1941, most likely intentionally released in Lake Worth. Brown anoles are found in the wild in Georgia, Texas, California and Hawaii. as well as Central and South America. They outcompete and displace native species, particularly the green anole in Florida, apparently relegating this once ubiquitous species to the tops of trees. The brown is more of a terrestrial lizard, the green more at home in foliage. Cold weather limits how far north brown anoles can spread. Males go a maximum of eight inches in length, females less. They are highly variable in appearance, mostly gray and brown. Males can have yellowish spots; they can have two brown stripes sandwiching a cream-colored stripe running down their backs. They can also have a crest-like ridge along their backs. All males, however, have the telltale inflatable throat membrane called a dewlap, pink to red to orange in color. Males inflate it to stake their territory and to attract lady lizards. They also do head bobs and "pushups" as part of their display. If caught by a predator, they can detach their tails if necessary to escape. Their diet includes spiders and insects — and other lizards. Brown anoles become sexually active at one year. Females lay a single egg in either moist soil or rotting wood every one to two weeks. And that is the limit of parental care among these animals. Most anoles live to 18 months; a few might make it to 36 months. Brown anoles are members of Polychrotidae, a family of lizards that includes the iguana. At one time, there were two distinct subspecies of brown anoles in Florida, a Cuban and a Bahamian, but they've intermixed to the point that the distinguishing characteristics have been lost. In case you were wondering (and we definitely were not) brown anoles are edible.